Heat oven to 450°F. In large bowl, mix berries, sugar, tapioca, salt and lemon juice. Let stand 15 minutes. Meanwhile, unroll 1 pie crust on work surface. Sprinkle both sides lightly with flour; place in ungreased 9-inch glass pie plate. Press firmly against side and bottom. Spoon berry mixture into crust-lined plate. Dot with butter. To make lattice top, cut second crust into 1-inch-wide strips with pastry cutter. Place half of the strips across filling in pie plate. Weave remaining strips with first strips to form lattice. Trim ends of strips even with edge of bottom crust. Seal and flute. Brush with egg white; sprinkle with coarse sugar. Place pie on middle oven rack; place sheet of foil on rack below pie in case of spillover. Bake 15 minutes, reduce oven temperature to 350°F. Cover crust edge with strips of foil to prevent excessive browning; bake 40 to 50 minutes or until golden brown. Cool at least 2 hours before serving. 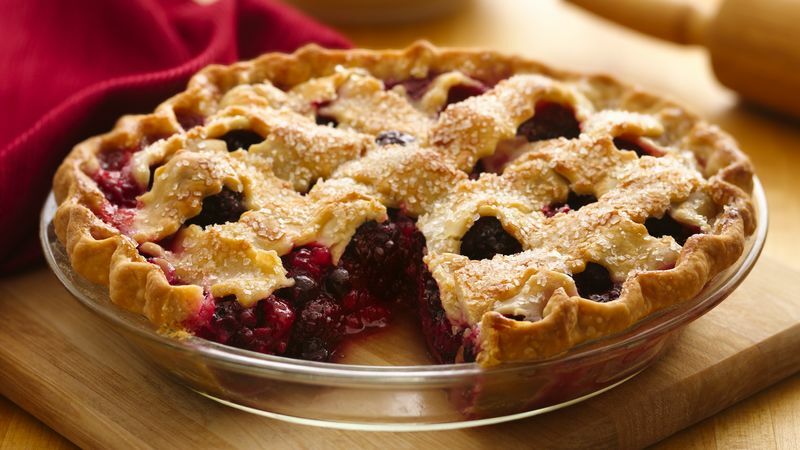 This recipe by Tamera Battle of Tacoma, Washington, placed 1st at the Pillsbury Refrigerated Pie Crusts Pie Baking Championship, 2009 Western Washington Fair. For a special touch, drizzle warmed blueberry pancake syrup over the top of each slice just before serving.